Toughest, smoothest spinning reel in its class. 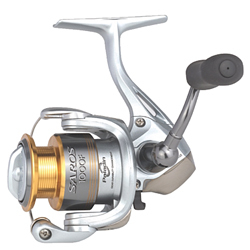 Technological advances include Shimano's exclusive Paladin Gear Durability Enhancement, with cold-forged aluminum drive gear and hardened brass alloy pinion gear for long-term smoothness, and the 5-component Propulsion Line Management System which reduces line friction, twist, and backlashes while increasing casting distance. Aluminum frame and spool; shielded A-RB bearings; Fluidrive II; Dyna-Balance; Super Stopper II; and waterproof front drag. "I really enjoy this reel and use with my Shimano medium action rod for drop shotting. It's smooth, has a nice drag, and is comfortable in the hand." "This is one of the greatest spinning reels out there! It casts far and not to mention it looks cool too! I own two of these reels and needless to say Im very impressed! I love the new line propulsion system these reels have." "I bought one of theese amzing reels ust recently after reading the reviews i saw the 5 star so i bought it and was extremly impressed when i even took it ice fishing in the millwaukee harbor and it was giving everything the fish could throw." "I purchased one of these reels back in August and I'm glad I did. It is far better than a few of my other reels (worths loads of money more) and out performs everything else. I have the 3000 series with the giant paddle handle."